Can you tell which is the Barn Owl and which is the Tawny Owl? Did you know that if you find a young owlet that has fallen from its nest, it is very important to know what sort of owl it is – as Barn owlets and Tawny owlets need very different care to ensure their survival. The owlets in this photo have been rescued by trained and experienced conservation staff from the Barn Owl Trust, who do everything they can to return owls to the wild. Often found in buildings (sometimes near a hollow tree or nestbox). Most fallen owlets are 5-8 weeks old. At this age they have some feathers but are still partly covered in fluffy white down feathers. Barn Owls have a round, heart-shaped face. Upper feathers mainly buff-coloured (light brown) with some grey/black/white flecks. The face and underside are mostly white. If the eyelid edges are brown it’s a young Barn Owl. Most likely to be found in woodland or under trees. Small Tawny Owl nestlings (up to the size of a grown up’s fist) almost entirely covered in short, thick grey down feathers. Larger nestlings (up to 150mm tall) are rather round and woolly looking with slightly wavy greyish-white and browny-buff barring (stripes) on very loose body feathering. If the eyelid edges are bright pink it’s a young Tawny Owl. So – did you get it right? The Tawny Owlet is on the left of the photo and the Barn Owlet is on the right! Imagine finding a baby owlet on the ground – what would you do? Is it better to leave it alone? Or try to help in some way? Healthy Barn Owlets that are too young to fly must be placed back in the nest. 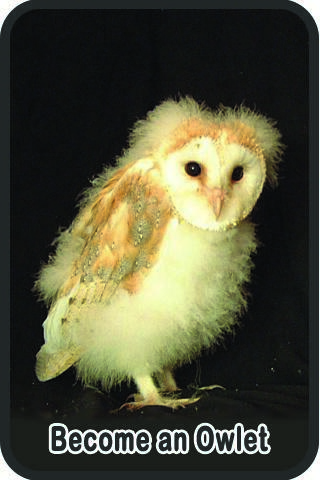 Find out why and how: ‘What to do if you find a young Barn Owl’. Healthy Tawny Owlets are usually best left where they are found – even if it can’t fly yet. Find out more: ‘What to do if you find a young Tawny Owl’.